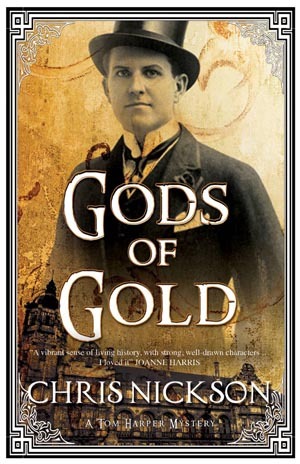 Gods of Gold was published in the UK yesterday – it comes out in the US on December 1. I’m giving away a copy, autographed if you want it, to one lucky (possibly unlucky) person. What do you have to do? Simply reply to this post with your name. Do it before 9am UK time on September 3, and after that I’ll select a name at random. LINK to the Victoria . Don’t imagine Downunderites are eligible but never mind I’ll find a way to read it anyway! And come out of hiding ? I’m sure the book is worth it : Judy Palmaers. Good luck and hopefully on our shelves soon. Works for me (wish it did, actually! ).